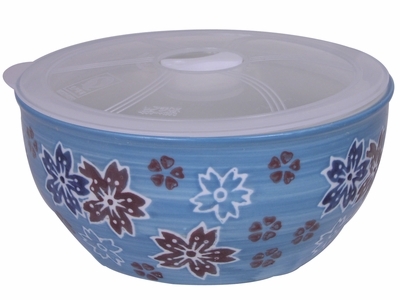 Perfect for storing food, this cherry blossom bowl is great for enjoying small individual servings of soups, salads, pastas, and desserts. Made in China from quality ceramic, this smooth and glossy cherry blossom bowl features the well-loved flower called “Sakura” or cherry blossoms. Popular due to their short but beautiful bloom, cherry blossoms are known in Japan as symbols of transient beauty. Mostly a dark baby blue on the outside of the cherry blossom bowl, dark red and blue cherry blossoms are outlined in white making them stand out even more. Smaller cherry blossom petals in red are also stamped across the entire outside of the bowl. The inside of the bowl is a solid glossy white which with overall classic colors like blue and white, matching this bowl with existing tableware will be a breeze. Microwave and dishwasher safe, this bowl with lid comes with a plastic lid that is perfect for storing or steaming food as well. The center of the lid comes with a small switch to open and close the vent to allow steam to escape or to keep food fresh inside. Packaged in a paper box.